Last week we made a small update to Floorplanner's interface, and more specifically, the placement of sharing and exporting options. 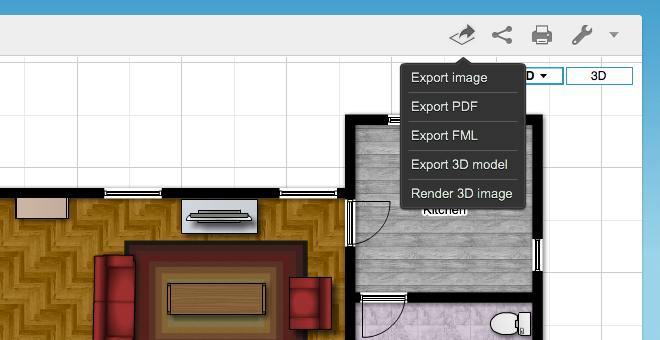 When you've made a floor plan that you're happy with, you'll probably want to do something more than just look at it: share it with your friends, put it on your website, or export a 3D file to use in another application. Previously these Sharing and Exporting options were located in the sidebar, but in light of how useful these features are we've moved them into the menu bar where they are more accessible. What you're able to export depends on your membership: while Basic accounts have the option to export 640x480 images and scaled PDFs, Plus and Pro accounts get the option to export images all the way up to 2800x2100, as well as huge PDFs (up to 1:50 scale! ), 3D models and renders. So now's a better time than ever to share what you've been working on with your friends and family.